Whenever I can, I complete an app before reviewing it, allowing me as fully formed an opinion of it as possible. But occasionally, a game contains too much content for me to be able to cover it entirely before reviewing it. Riot Rings ($0.99) is one such game, an accessible bubble popper/marble-shooter inspired by the likes of Luxor, the no longer available StoneLoops and countless flash games before them. In the game, you aim at rings of animals as they follow paths around the screen, pelting them with more animals in an attempt to create chains of three or more of the same species. You shoot from a fixed position that changes with every level, although generally speaking it’s in the centre of the screen, surrounded by rings. The game begins fairly unemphatically, hiding all of the game’s freshness and pace, but picks up as you progress through it. Rings begin to rotate more quickly, jolt backwards and forwards, and their paths even shrink, making their ends closer together. If the ends of a ring touch, it’s game over and you’ll have to replay the level. 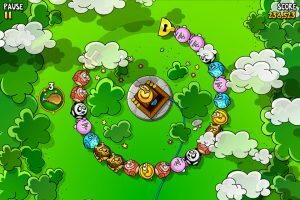 This mechanic makes the game exciting – you have to shoot tactically, because if you shoot at a ring too much without matching any animals, it causes the ends of the ring to move closer together and you have to work harder to complete the level. Also adding to the franticness of the game is a hidden time limit, which means that you can’t take too long dawdling through a level – a 15 second warning pops up to inform you that if you don’t hurry yourself up, you’ll be playing the level again. Level design itself is varied and creative. Animals fly in from off-screen, propelling you ever closer towards the replay level screen. Power-ups allow you to slow down ring movement, get rid of chunks of animals and more. Spotting and understanding the subtleties of the game mechanic adds depth to the game, whilst extra pressures like wasps flying at you from the side of the screen ensure that it never gets boring. There’s nothing hugely original here, but that doesn’t make Riot Rings any less fun. Variety, as the saying goes, is the spice of life. In accordance, Riot Rings is pretty well spiced. It comes with three modes: in Campaign Mode, you play through levels as described above; Free Play appears to be exactly the same as Campaign Mode, so it’s not really worth classing as a separate mode, and the endless Zen Mode has you shooting at rings that get progressively harder to clear. There are 101 levels in Campaign Mode, and they each take a few minutes to complete, so there’s hours and hours of content here. Similarly, Zen Mode is oddly addicting and happily munches away at your time in ten to twenty minute chunks. To complete the package, the app comes with bright, playful graphics that will appeal to children and adults alike. Menu systems are easy to navigate, fonts are easy to read, buttons are easy to press and level titles are amusing. Basically, the fundamentals of the app are all present and correct except for one odd exclusion – there’s no soundtrack. Sure, the game has good sound effects (including an annoying ‘amazing! Great! Fantastic! Patronising praise!’ voice), but no music (except for in menus). It wouldn’t be a major issue if the game let you listen to your own tunes, but it doesn’t. Although it comes with leaderboards, the game is also missing achievements – a minor quibble, but irritating nonetheless. Overall, Riot Rings is an engaging app brimming with content, addicting gameplay and cute graphics. It nails most things on the head, but forgets in-level music. For the price, it should definitely be on your device, and is likely to remain there for a long time indeed. Next Article Interview: Alistair Aitcheson talks Greedy Bankers 2, life as an iOS developer and much more.